William Shew, one of the most famous American daguerreotypists of his day, maintained a photographic studio in a mobile wagon, allowing him to travel to his customers, and enabling him to maneuver out of the way of San Francisco's many fires in its early years. On the side of the studio, Shew arrayed a sampling of his handiwork to advertise to potential customers. 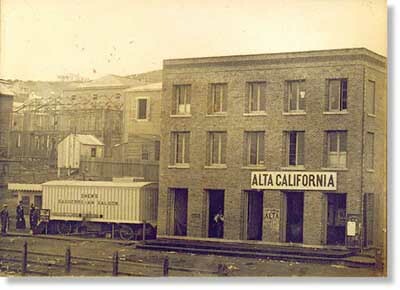 The Alta California was one of the most important early San Francisco newspapers. Owned and edited by Edward Kemble and Edward Gilbert, it began as a weekly in January 1849, and became the city's first daily paper in January 1850. In 1867, Mark Twain sent his letters from his tour of the Holy Land to the paper, letters which were later republished as The Innocents Abroad. The paper ceased publication in 1891.